Today I found out the most recent version of the United States’ flag was designed by a high school student who initially received only a B- for his proposed design. In an American history class, we had to do an outside of class project. We could make or do whatever we wanted, like a science fair or something like that where you bring your project in. The Betsy Ross story intrigued me. My Mom and Dad had a 48 star flag they received as a wedding present, which of course meant a lot to them. Well, I took scissors and cut it up. I had never sewn in my life. I watched my mom sew, but I’d never sewn. And since making the flag of our country, I’ve never sewn again. So anyhow we get to class, I had my flag on my teacher’s desk. The teacher said, “What’s this thing on my desk?” So I got up and approached the desk, and I’m shaking like a leaf and he says “Why have you got too many stars? You don’t even know how many states we have.” (He had added more for the potential new states of Alaska and Hawaii being added to the U.S.) And he gave me the grade of a B-. Now, a B- wasn’t that bad of a grade. However, a friend of mine, Jim, picked up 5 leaves off the ground, he’s taping these leaves down to a notebook and labeled them elm, hickory, maple, and the teacher gave him the grade of an A. 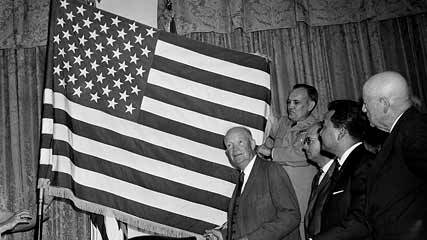 In addition to designing the current flag, Heft also designed a 51 star flag, ready to be proposed should the need arise. He designed and made it just a few weeks after completing the 50 star version. In his 51 star flag, it has six rows alternating between nine and eight stars. When he died, he gave this 51 star flag to Rep. Clarence Miller of Ohio to submit should a new state be added to the union. If it’s eventually accepted, it will make Heft the first person ever to design two U.S. flags. Although the Betsy Ross / 13 star flag story is taught to most American students at some point in grade-school, it probably isn’t true at all. Most historians today think that she likely didn’t design the first flag. In fact, there is little evidence to show she was even involved in any way in its making. The story itself didn’t even pop up until 34 years after she died and nearly a century after the flag was made. Further, there is no documented evidence that she herself ever claimed to have been involved with it. The story came from her lone surviving grandson, William J. Canby, who was 11 years old when she died and who claimed he had heard his grandmother and family members talk about her creating the flag. This is somewhat more controversial in that he seems to have waited until all others in his family who might have corroborated his tale had died before coming out with it. The generally held, though not technically official, real first flag of the U.S. was the “Continental Colors”, which was almost an exact copy of the British East India Company flag, as you can see on the right. 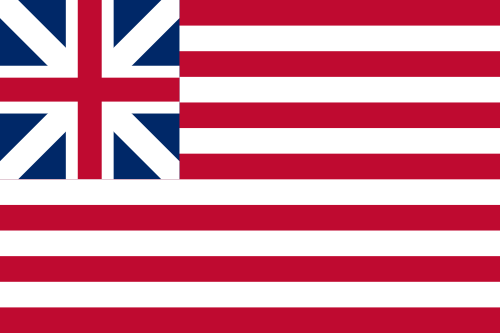 This flag was commonly used for about a year after the initial declaration of independence until the stars and stripes were adopted. The exact red, white, and blue colors of the U.S. flag traditionally are from the CAUS Standard Color Reference of America “White”, “Old Glory Red”, and “Old Glory Blue”. There is no exact way to convert these specific colors to RGB format or CMYK, so the relative RGB colors to be used for the American flag are #FFFFFF for white, #B22234 for red, and #3c3b6E for blue. The exact pattern of stars was not officially set until 1912 and the exact colors weren’t set until 1934. According to the United State Flag Code, which incidentally is Federal Law, if a U.S. flag is flown at night, it must be illuminated. Further, a tattered U.S. flag should be burned and replaced. Despite the fact that the U.S. Flag Code is Federal Law, it is widely ignored, even by such entities as NASA. For instance, NASA ignores the “streaming” code, that states when a flag design is put on the side of a vehicle (such as a space craft), it must be oriented such that, if it were a real flag, it would be streaming backwards as the vehicle travels. NASA failed to adhere to this rule in Mercury, Gemini, and the Apollo missions. Further, the flag code states that the flag should only be worn on your right shoulder, but astronauts since Gemini 4 have worn the flag on the left shoulder of their space suits, excepting during Apollo 1. Another commonly ignored aspect of the U.S. Flag Code is that the flag must never be used on bedding, drapery, pillows, or apparel if the flag used is the actual official U.S. flag design. If it is merely a close approximation, then it is acceptable. However, in no case is it allowed to be used for advertising purposes (though, of course, it kind of inherently advertises the U.S. and possibly someone’s apparent patriotism, so…). Also, it must never be printed on anything that is disposable like napkins, handkerchiefs, boxes, paper plates, etc. The reason the Flag Code laws are not typically enforced anywhere is because it violates U.S. citizens’ First Amendment rights. Since 1818, by tradition, whenever a new state is added to the Union, a star is added to the flag for that state and it is officially adopted as the new U.S. flag on the 4th of July following the state’s admission. The 13 stripes on the American flag represent the first 13 British colonies that seceded from Britain to form the United States. In 1795, the number of stripes was increased to 15, due to the addition of Vermont and Kentucky as states, but was returned to 13 in 1818. 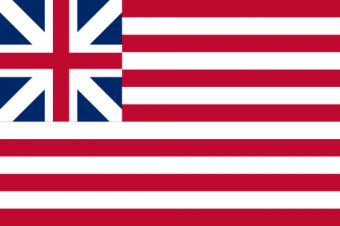 During the interim, the official flag had 15 stars and 15 stripes, despite the fact that new states were added, largely due to the fact that it was seen as infeasible to continue to add stars and stripes for every new state. 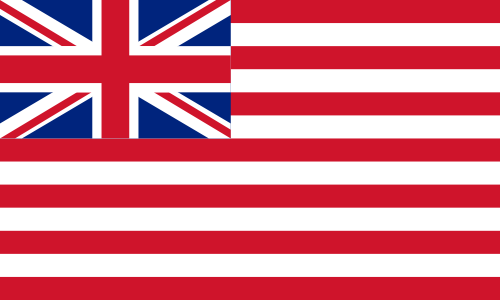 This was changed in 1818, when it was decided to return to 13 stripes and simply add a new star for every state. Despite being offered as much as $350,000 for his original school project flag, Heft hung onto it, though he occasionally lent it out to be flown at various places. To date, it has been flown over every U.S. state capital and over 88 U.S. embassies. I also read in one interview that he was looking into selling it to establish a trust fund for a great niece and nephew (the children of his nephew he raised; Heft had no children of his own). However, I was not able to find whether he actually sold the flag to anyone before he died. After retiring from teaching and serving as longtime mayor of Napoleon, Ohio, Heft traveled around, on average about 100,000 miles per year, giving motivational speeches, as well as sharing his story of designing the flag. He averaged about 150 speaking engagements per year during his retirement. Cool post, I always wondered how they came up with the new flag after Alaska and Hawaii were added. That’s pretty cool. They went through 49 one’s pretty fast for Hawaii. Have you seen some of the 51 star desings? I guess Rep. Clarence Miller would have handled it back in the day though. 51 stars?? What the hell are you people trying to imply? Never, never going to happen. And you’re not getting Hans Island. Interesting story of the american flag. As a French, I’m keen on everything about the USA historical events. I heard about the origin of this flag watching the french version of Pawn Stars on a TV channel.